Watching the Gucci live stream from Milan earlier, I did a double take when I saw these sandals from the label’s FW10 collection. 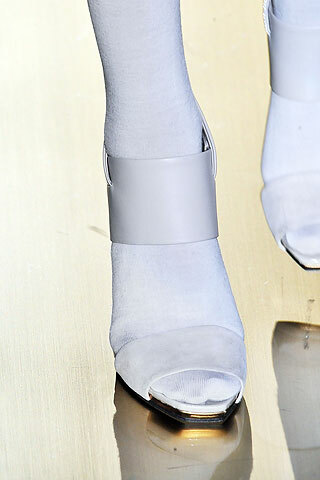 Sandals with socks @ Gucci FW10/11. Well, they are the sole sisters (no DNA test required) of these Other Italians…by Miuccia Prada for FW07. Two panel sandal with semi-socks @ Prada FW07. I didn’t like the Prada ones at all until I saw Giovanna Battaglia in them, as captured by Sart. The lighter ones really do look like the Guccis, don’t they? A sartorialist shot by The Sartorialist, September 2007. Shoe shots from Style.com. Giovanna photo by Scott Schuman.